Footscray is part of Melbourne's 'western suburbs', situated on the west side of the Maribyrnong River, 6 km west of central Melbourne. In 1839 a punt was installed across the Maribyrnong River near where Bunbury Street, Footscray, runs down to the river. It was used for transport from Williamstown and Geelong to Melbourne. The alternative crossing point was several kilometres upstream at Solomon's ford, between Avondale Heights and Sunshine (near the northern end of Duke Street). The location of the punt was where the land rose fairly sharply from the river's shoreline. In a short time an inn was opened near the punt. A township was surveyed on the river's western bank near the punt in 1849. Its street configuration runs parallel to the river bank, distinguishing it from the rest of Footscray. The origin of the name is from a village south-east of London, not far from Maidstone, Kent. Maidstone is also a suburb north of Footscray. In 1853 and 1855 the Catholic and Anglican churches opened primary schools in Wingfield and Bunbury Streets, the core of the original town survey. A mechanics' institute was opened in 1860. Railway lines were opened from Spencer Street, Melbourne, (via Footscray) to Williamstown and Sunbury in 1859, a few months after the Footscray municipality was proclaimed. The municipal boundary extended across to the east side of the Maribyrnong River, into Coode Island, occupying the land from today's Swanson Dock northwards to where the railway line crosses the river. (The association continued until 1999 with the Footscray postcode applying to Coode Island.) In 1863 a bridge for road traffic was opened across the river, and over the next ten years the difficult route of the Swamp (Dynon) Road to Melbourne was constructed. At the place where Footscray rises from the site of the old punt there is a layer of basalt. This stone became a major quarry industry. The 1860s saw more than a doubling of Footscray's population as industries were opened. Many of them were noxious – tallow making, hide treatment, meat preserving and fertiliser manufacture. The population required the opening of a National School in 1860, which became the State primary school. Footscray and the neighbouring district of Flemington increasingly became the location for the metropolis's noxious industries. The river was a convenient sewer, and solid material was left to decompose, often in the optimistic hope that farmers would remove it for manure. Although less noxious industries came to Footscray they did not replace the noxious ones: the last time the annual rowing regatta was held on the Maribyrnong River was in 1885, by when the smell from the river became too much and the Albert Park Lake offered a more wholesome environment. Football began in an organised way with the formation of the Footscray Imperials in 1883. A conspicuous growth in manufacturing, housing and commercial premises came in the 1890s. Houses were mostly of timber, but on larger allotments than in other inner suburbs. The municipality became a city on 20 January 1891, a proud moment before the 1890s economic depression which plunged Footscray into unemployment. One outcome of the depresssion was the endorsement of Labor candidates for municipal election, who within 20 years gained a majority in the council chamber over the self-made businessmen who had previously run Footscray's affairs. Labor's local conquest occurred against a background when most of Victoria's agricultural manufacturing had relocated to west of the Maribyrnong River and President Higgins of the Conciliation and Arbitration Court had pronounced on a fair living wage of employees at the nearby Sunshine Harvester works (1907). With the decline of mining in several goldfields areas, provincial manufacturing moved to Footscray to become metropolitan manufacturing. After World War I Footscray underwent its second spurt of industrialisation and population growth. Some of the most enterprising artisans who became entrepreneurs had depended on the mechanics' institute for their learning, but in 1916 a wider offering of education came with the opening of the Footscray Technical School (now Footscray City College). The only other State school going beyond year six until then was Hyde Street's central school. The Footscray high school was opened postwar (1955) but closed in 1996. Footscray's development corridors were along the river bank and railway lines. Unlike Melbourne's eastern suburbs in the previous century, trams had not come west of the Maribyrnong River. In 1921 tramlines were opened along Barkly Street and from west of Yarraville, to middle Footscray and on to Maribyrnong. By then Footscray had been dubbed the Birmingham of Australia, with a growing pride in its manufacturing and its local football club's nine Assocation premierships. In 1924 the club joined the Victorian Football League after passing the test of beating the League's premiership team, Essendon. The sport-mad town, however, had citizens who wanted facilities for children. The local businessman J.T. Tweddle financed a babies' hospital and mothercraft school (1924), and the council supported a School of Domestic Arts (1925), later a Girls' high school and Gilmore College for Girls. It became an educational showpiece, outdoing private schools by attracting scholars from middle class families. The council also established kindergartens and a children's library, and began the long task of getting the Footscray and District Hospital. An economic depression and unemployment began in Footscray during the mid-1920s, and lifted by the mid-1930s, somewhat earlier than was experienced elsewhere. A new town hall was opened in 1936. Commercial and residential building revived. Manufacturing industries in the area supplied goods and material needed for the war (particularly munitions at Maribyrnong), and women found well paid employment. After the war the hungry market for domestic consumption caused a high demand for labour. Footscray and Braybrook councils sponsored housing estates to supply the labour, and residential settlement extended to Footscray West and Kingsville (west of Spotswood). The upsurge in housing stimulated shopping, and the new residents followed the pattern of previous Footscray residents by shopping locally. The Footscray shopping centre was described in the Melbourne Metropolitan Planning Scheme Report (1954) as being the strongest suburban centre in Metropolitan Melbourne. The postwar years were a continuation of Footscray's passion for sport. The football club recruited promising players and under the captaincy of Spotswood's Charlie Sutton won the premiership in 1954. Among the star players was Ted Whitten, whose name was given to the club's Western Oval. In retailing, Footscray gained prominence from the local Forges department store and from the pioneering self-service groceryman, Bill Sims, who was described by the president of the American Supermarket Institute as one of Australia's best operators in 1955. The Footscray shopping centre created a pedestrian mall in 1971, coinciding with plans for the regional shopping centre at Highpoint West, a 3 km tram ride north of the Footscray centre. 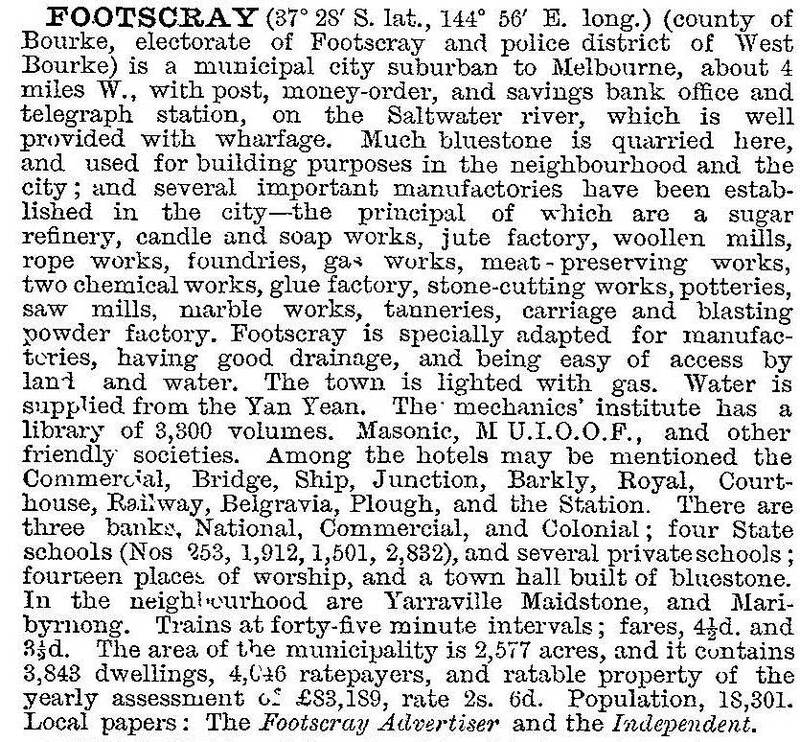 Footscray's manufacturing industries and relatively low house prices attracted migrants, English and European after the war and later from Asia and the Middle East. In 1976 residents born in Yugoslavia, Greece or Italy were 22.5% of Footscray's population. In 1986 they were about 17%. Residents born in South-East Asia went from about 1.5% to 8.5%. The Footscray technical school became an Institute of Technology and in 1990 the Victoria University of Technology. The change mirrored the employment opportunities. In 1976 46% of Footscray's employees worked in manufacturing, and ten years later the figure was 31%. Footscray has three notable public reserves. The football oval is well-known but another, Footscray Park, is several times larger and underrated. It was begun in 1910 when in danger of being sold for subdivision, and was designed and curated to high standards. It runs along the river, opposite the Flemington Racecourse. Further downstream, where the Footscray wharves and noxious industries created a decrepit landscape, the Maribyrnong River Bicentennial Project made significant changes. The Angliss meat works and its stock paddock became a housing estate and a wetlands park (1988), and the wharves area gained two reserves with a community arts centre (formerly part of Hendersons' bacon curing factory). The former quarry and Footscray council tip became Quarry Park, and immediately north of the park the Commonwealth munitions factory became a medium density housing estate. There are heritage precincts in old Footscray at Bunbury and Whitehall Streets, etc. The railway station (1899), one of Melbourne's busiest, is heritage listed. Other heritage sites are the town hall (1936) in Napier Street, the former Barkly theatre (1914), Footscray Park and its war memorial, and the railway bridge (1858-) over the river near Newells Paddock Wetland. Median house prices in Footscray have risen, partly as a result of a general uplift in western suburb property prices and partly because of Footscray's proximity to central Melbourne. In 1987 Footscray's median house price was 69% of the metropolitan median, and in 1996 it was 88%. That, however, contrasted unfavourably with the finding in 1997 that 61% of Footscray's children were in families on welfare benefits or classed as working poor, the highest in metropolitan Melbourne. The Footscray municipality, after transfer of its Coode Island area to Melbourne council, had an area of 17.1 sq km. On 15 December 1995, Footscray city and part of Sunshine city were united to form Maribyrnong city. Footscray hosted the inaugural Contemporary Pacific Arts Festival in 2013. Melbourne's Wholesale Fruit, Vegetable and Flower market was scheduled to move from Footscray to Epping in 2014-15.